Arthur Du leads a group in Tai Chi practice. Arthur Du was a hotel Senior Advisor in Jiangsu, China. He moved to Missouri last March with his wife to company their son, who plans to stay in the U.S. after graduation. Language became an obstacle for Du to continue his career in an English-speaking country, so he decided to make a living by teaching Tai Chi, which has been his hobby since he was a child. Tai Chi is a type of Chinese martial art practiced for both defense training and health benefits. It’s not new to Missouri, but has seen increased interest in it in recent years. 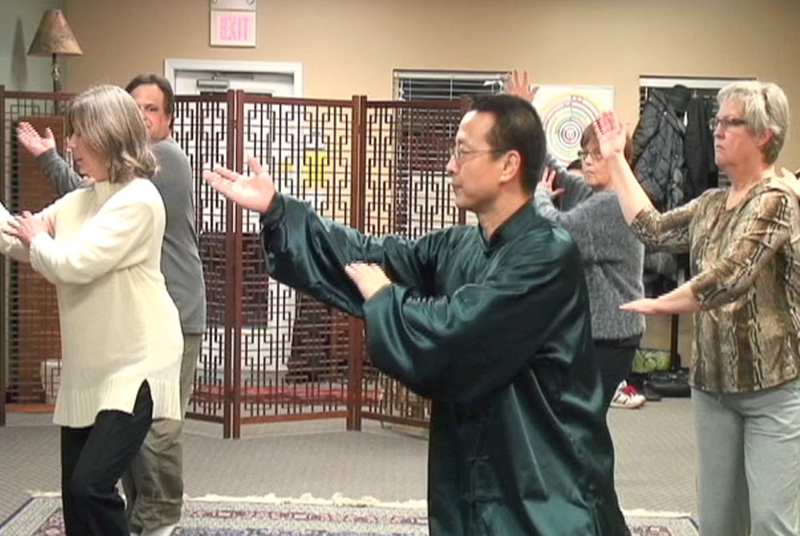 With more and more Missourians get to know about Tai Chi, Du has seen a big jump in the number of his students in the past one year. Having a student body of around 100 people, Du has two classes to teach a day on average currently. While teaching the locals this traditional Chinese martial arts, Du is also learning from his Missourian students. Physical knowledge as well as culture knowledge are exchanged in this Tai Chi class. This story is part of The China Connection a multimedia project exploring various economic, educational and cultural links between Missouri and China. Hs iao-Mei Wiedmeyer carries a tray of black-bone chicken stewed with wild yam and goji berries to serve after Arthur Du and his son, Brendan, finished preparing the soup Nov. 12. Hong Kong Market, 3510 I-70 Drive S.E. ; 474-2878. Chong’s Oriental Market, 701 Locust St.; 443-1977. Salted chicken wing (Nanking style), candy chestnuts with roasted pork loin and a mixed black and white tree ears salad and decorations prepared by Du. Clockwise from center, Ray Wiedmeyer, Renita Richmond, Kenny Greene, Paul Wallace, Robin Remington, Rob Robinson, Laura Jolley (not shown) and Hsiao-Mei Wiedmeyer toast Nov. 12 before their Chinese dinner prepared by Arthur Du. In March, Arthur Du came from China to Missouri. Since then, he has practiced his English and taught tai chi (Taiji) classes. In those months, he also has slowly built one flavorful stock for soups and other Chinese dishes. On Nov. 12, Du used some of his 6-month-old broth in his Nanking-style salted chicken wings for a multicourse dinner for eight in the home of Ray and Hsiao-Mei Wiedmeyer. As good as it was, this broth was a little young, he said. Du is from Nanking, Jiangsu Province, in southeastern China, where he knows of a brine preparation that is 100 years old. The stock, he said, is the heart of Chinese cooking. It is like gold. Each time it is used, something more also goes into it, so as the stock grows, the flavors within it become more complex. Du also is building a new life. He wants to make Columbia his home and bring his wife here, so they can be near his only son, Brendan, 21, a student at the University of Missouri. When Hsiao-Mei met Du in July, she learned that in China, Du was a tai chi coach and a Chinese herbal expert. After he cooked for her, she was not surprised to learn he also was a “Class 1” chef and has managed five-star hotels in Nanking. Hsiao-Mei, a retired chemist, grew up in Taiwan. She likes to cook Chinese food, and she holds on to many of the traditions. The ginkgo trees in her front yard were shedding their yellow leaves in November. She had just harvested the nuts and shared them with a guest. “The Chinese use these in cooking,” she said. “It is very mild and good for the memory.” When I arrived, Hsiao-Mei had been busy chopping garlic for Du. She was his cheerful sous chef for this meal. Brendan also was in the kitchen, to help his dad and gladly sample any leftovers. He said he was happy to see his father finally doing what he loves, rather than supervising others who are cooking. Du enjoys teaching tai chi, and he also dreams of starting a sort of catered dinner-club business offering authentic Chinese dinners and — when called for — the narrative to go with them. After this meal, he found some avid fans of his cooking. He had arrived in Hsiao-Mei’s kitchen on a Saturday, ready to spend the day cooking. He brought some of his stock, the sauces that had been simmering and his artfully carved vegetables that would serve as table decorations. Most Chinese food in the United States is not authentic, Hsiao-Mei said as she followed Du’s instructions to chop the garlic and carefully line bitter melon slices and goji berries in the shape of a circle. Chinese-American restaurants adjust to American tastes, she said. Nothing wrong with that, she said. It just isn’t what the Chinese eat in China — or at home in Columbia, for that matter. “The food must also look pretty,” she continued. “Color, smell, taste and presentation are all important.” Du picked up her bowl of carefully placed bitter melon, set a plate over it and turned it upside-down onto the plate, forming a gleaming green-and-red dome, which he topped with some minced garlic. It was very pretty, nearly as pretty as the chrysanthemum Du shaped from a daikon radish and the potatoes carved into roses. He used the edge of an aluminum Coke can to do the carving. “He’s amazing; that’s all I can say,” Hsiao-Mei said as she watched her new friend cook, taste, plate, clean and clear the decks for the next dish.